What indicators best measure progress towards the EU’s energy objectives? This project involved the provision of assistance to the EEA in sourcing and analysing potential indicators to monitor progress towards EU energy policy objectives. The EEA considers updating its energy indicator set to more fully cover the diverse and evolving set of objectives and make a stronger link with other environmental policy areas. The project is was led by Trinomics and assisted by Aether. The project ran from May to November of 2018. In the final output of this project we gave some suggestions on how the existing energy indicator could be improved. 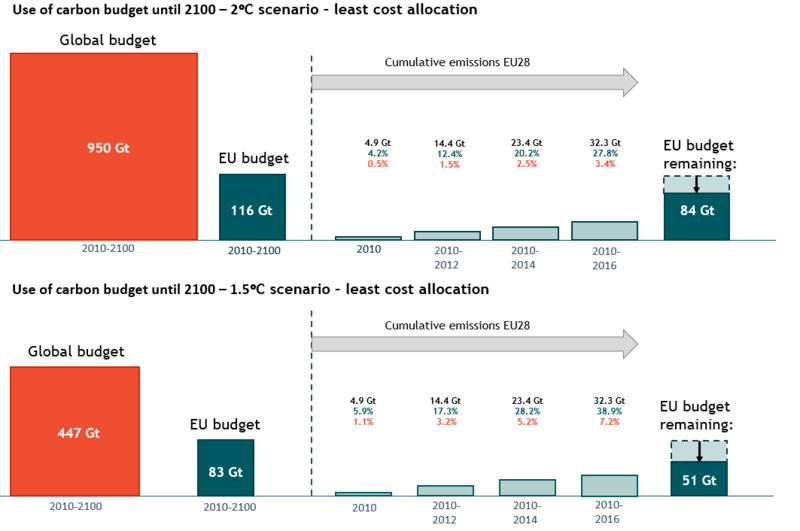 In our quest for potentially relevant indicators we also analysed some more innovative indicators, including indicators relating to consumption based emissions and the remaining carbon budget (see figure below).